2017-04-30 ~ National Association of Postal Employees, Tirunelveli Division. The outcome of the standing committee held on 03/05/2017. The protest of the staff side regarding the abnormal delay in implementation of revised allowances from 01.01.2016, increase in minimum pay and fitment formula, Option -1 parity of Pensioners, revision of pension and grant of dearness relief to autonomous body pensioners etc was conveyed to Secretary, Department of Personnel who chaired the meeting. The proposed move to close down DGS&D was also raised. The cabinet has approved the parity in pension recommended by the Pension Committee constituted by Govt w.e.f.01.01.2016. (Whether it is 5th CPC recommended parity can be confirmed only after seeing the orders). திருப்பதி ஏழுமலையானை தரிசிக்க பாளையங்கோட்டை தலைமை அலுவலகத்தில் டிக்கெட் பெற வசதி செய்யப்பட்டுள்ளது. The Department of Posts has launched this facility from April 26 and one can obtain Rs. 300 ticket for darshan at 10 a.m., 11 a.m., 12 noon and 1 p.m. The entry ticket permits registration for six persons and one of the members of the group can obtain the ticket from the post office. He has to upload the pictures of other group members and should bring the Aadhaar card of all the six members for registration. 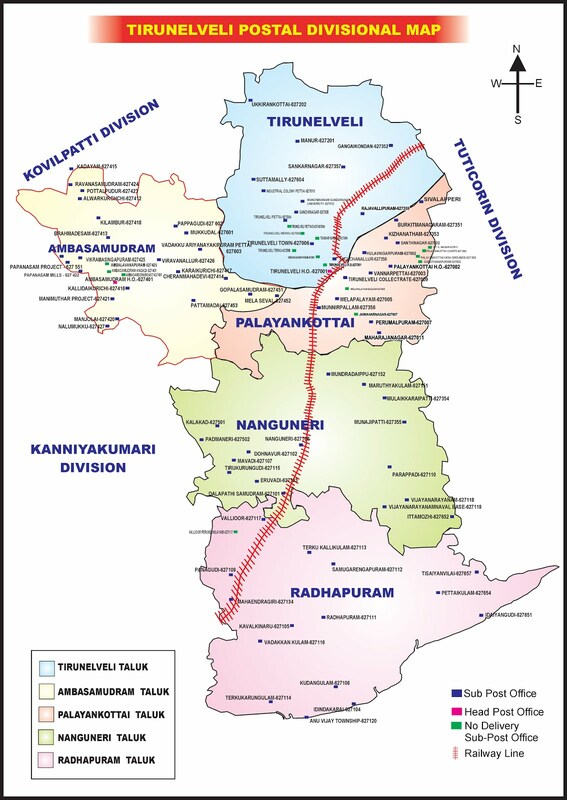 If the Residents of Tirunelveli planning for a pilgrimage to Tirupati, he can now book special darshan tickets through the Palayankottai Head Post Office here. You may be aware of many speculations surrounding Cadre restructuring and its implementation. This article had been drafted to put an end to such speculation and to vent out the doubts in employee’s mind. Senior most HSG-I with minimum 2 years of service are eligible for HSG-I Non functional Cadre. As such, Postal Assistant irrespective of their GP will first be promoted to LSG only. Some comrades were raising a question that whether MACP III (4600 GP) will directly be placed in HSG-I post. No not at all, For getting promoted to HSG-I, one have to work in HSG-II cadre for at least 5 years of service. So they will be placed in LSG first. So there are chances that, many HSG-II places may be vacant due to non availability of elibilge officials. So union is asking for one time relaxation to Recruitment rules for posting the officials. Whether MACP-II (Grade pay 4200) PA be placed in HSG-II(before Cadre restructuring A CLASS OR LSG OFFICE) after Cadre restructuring? No. MACP is mere financial up gradation. MACP-II official is also should be treated as PA. As such they will be getting promoted to LSG first. What is the tenure for single handed/Double handed offices, Treasury after Cadre restructuring? 2 years .As per Directorate order no 4-7/2009-vig dated 07.10.16 these Posts comes under sensitive posts . So they will be rotated after 2 years. Who is competent for posting of PA in LSG post (previously single/double handed) after Cadre restructuring? As LSG is a circle cadre, Posting for the LSG and above posts will be done by Circle office. So Posting of SPM in single/Double handed will be done by circle office. 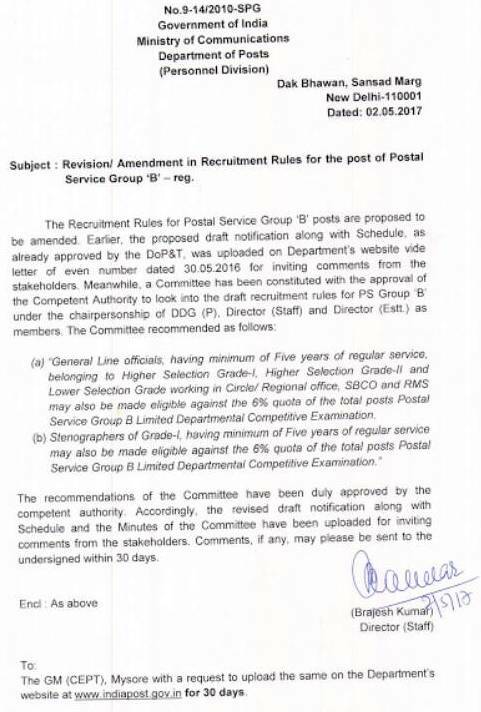 Divisional head can issue transfer orders only for Postal assistants Posts. Whether System Administrator, Marketing Executive are LSG posts after Cadre restructuring? As of now, they are PA cadre only. There is no LSG posts for System Administrator, Marketing Executive cadre. If a time scale PA happens to officiate for more than 14 days in LSG post (i.e as SPM in single hand/double hand), whether he is eligible for officiating pay? Yes, if an official officiating in higher post for less than 14 days, he is not entitled for higher pay. However, even if the first spell is less than 14 days but subsequently extended, the official officiating in the higher post is entitled for higher pay as per the Directorate letter No. 9-25/82-SPG/SPB II dt. 29.05.86. Whether MACP-I (2800 GP) official working in single handed office will get disturbed after Cadre restructuring ? May or may not be. It is subject to grant and acceptance of LSG. As of now, though he/she is placed in 2800 GP he/she is only PA. If that official was granted LSG he/she may not get disturbed else LSG official will be posted in that office. A LSG official working currently in APM (now upgraded HSG-II after Cadre restructuring) can continue in his post? May or may not be. If another HSG-II official opts for that post he had to work in other LSG Post. If no eligible officials, they may continue to officiate in HSG-II. The Supreme Court has ordered a mental examination of Justice Karnan to determine if he is fit to defend himself in court. There was more drama yesterday in the suo moto contempt petition against Justice C.S. Karnan before a seven-judge bench of the Supreme Court, with the court concluding that Justice Karnan may not be medically fit to defend himself in the contempt proceedings, based on his press briefings and orders. The Supreme Court ordered that he should be medically examined by a board of doctors from Pavlov Government Hospital, Kolkata, which was asked to report to the court whether he is in a fit condition to defend himself. Calcutta Pavlov Hospital, as it is called on the website of Bengal Health and Family Welfare Department, is a mental hospital. By asking for a medical examination to be conducted by doctors from this hospital, the Supreme Court is questioning Justice Karnan’s mental fitness. Indian law recognises two related but distinct concepts of unsound mind and mental illness. Although these concepts have been treated as synonymous at times, the law does distinguish between the two. Mental illness is a medical condition while unsoundness of mind is a legal finding. Indian Contracts Act, 1872 is the only law in the country that defines a sound mind. According to the law, a person is of sound mind if at the time of making a contract, he is “capable of understanding it and forming a rational judgment as to its effects upon his interests”. Thus, mental illness is neither necessary nor sufficient for a finding of unsound mind. Even if the medical board finds that Justice Karnan has a mental illness, it does not automatically imply he is of unsound mind. Clause 5 of the Mental Health Care Act, 2017 says “determination of a person’s mental illness shall alone not imply or be taken to mean that the person is of unsound mind unless he has been declared as such by a competent court”. Irrespective of his mental health status, the Supreme Court will have to satisfy itself that Justice Karnan is incapable of understanding his actions and is unable to form a rational judgement of the effects of his actions on his interests, and thus make a declaration that Justice Karnan is of unsound mind, before halting legal proceedings. Indian law allows for legal proceedings to be stayed if a person is of unsound mind. On the other hand, Justice Karnan may claim that the Supreme Court is trying to malign him and portray him as mad as he has made serious allegations against the court. Clause 3 (b) of the Mental Health Care Act says mental illness is not to be diagnosed based on non-conformity to moral, social, cultural, work or political values. Justice Karnan’s battle has been with his peers and colleagues and he has been accused on not living up to judicial behaviour, displaying “abject disrespect” to the Supreme Court and thus not behaving in conformity with his professional values. There are no reports of Justice Karnan exhibiting any abnormal behaviour in his interaction with the press or public, or in his personal life. Can Justice Karnan claim that he cannot be diagnosed as having a mental illness under the Act merely based on non-conformity with work values? Given these factors, one wonders what can be achieved by ordering a mental health examination. Besides, there are practical problems in implementing the court’s order. The Supreme Court has asked for the medical report to be submitted in eight days. Psychiatrists will struggle to arrive at a definite conclusion about the presence or absence of mental illness within eight days, especially since Justice Karnan is unlikely to submit himself to examination and/or co-operate with a psychiatric examination. It may be further argued that it is impossible for a group of psychiatrists to arrive at any conclusion about the presence or absence of mental illness in the current situation, even if the court were to give them more time. Psychiatrists are thus placed in an unenviable position of having to conduct a medical examination with little co-operation from the person concerned and submit a medical report in an unrealistic time frame for what is essentially a work related legal conflict between the country’s senior-most judicial officers. Mental health professionals will also have to consider other legal aspects in this case. The Mental Health Care Act allows mental health professionals to examine a person with their consent, or with the consent of a person’s nominated representative in very limited circumstances (violence towards others or self or lack of self-care putting the person’s life at risk), or without consent in a medical emergency. It is unlikely that Justice Karnan will consent to being examined nor can his nominated representative consent for his examination since he does not fulfil the criteria for consent by a nominated representative and clearly there is no medical emergency. If they cannot do it under the Mental Health Care Act, under what legal authority will psychiatrists examine Justice Karnan, if they insist on doing so? Can psychiatrists be prosecuted under the Act for violating its provisions or does an order of the Supreme Court override the provisions of the law and grant them immunity from prosecution? One further issue from the Supreme Court order merits attention. Immediately after ordering a mental examination of Justice Karnan on the suspicion of him being unfit to defend himself, the Supreme Court also asked him to submit his response to the notice issued to him by the court in the next eight days. The court further said if he chose not to file a response it would be presumed he had nothing to say in the matter. It is difficult to understand the Supreme Court raising a question of the accused person’s mental fitness to defend himself and simultaneously asking the person to submit his defence to an earlier notice! 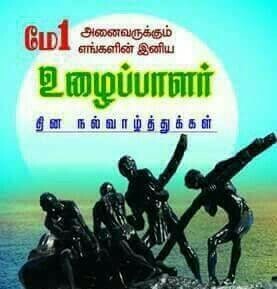 International Labour Day is also known as the International Worker’s Day and May Day which is celebrated on an international level to promote and encourage the international labour associations. It is being celebrated all across the world every year on 1st of May which has been declared as the traditional spring holiday in the Europe.It has also been declared as the national holiday in almost 80 countries of the world whereas it is being celebrated as an unofficial event in most of the countries. It the US and Canada, it is (Labour Day) celebrated on 1st Monday of the September month as an annual holiday for celebrating the great achievements of the workers working in various fields.